AMC’s The Walking Dead, now in its third season, centers on Rick Grimes (Andrew Lincoln), a former deputy sheriff from Georgia leading a small band of survivors to safety in the aftermath of devastating zombie apocalypse. Called walkers (they roam endlessly and never tire), the moaning, decaying, zombies are a deadly lot, as they shuffle in wandering herds, seeking live flesh. 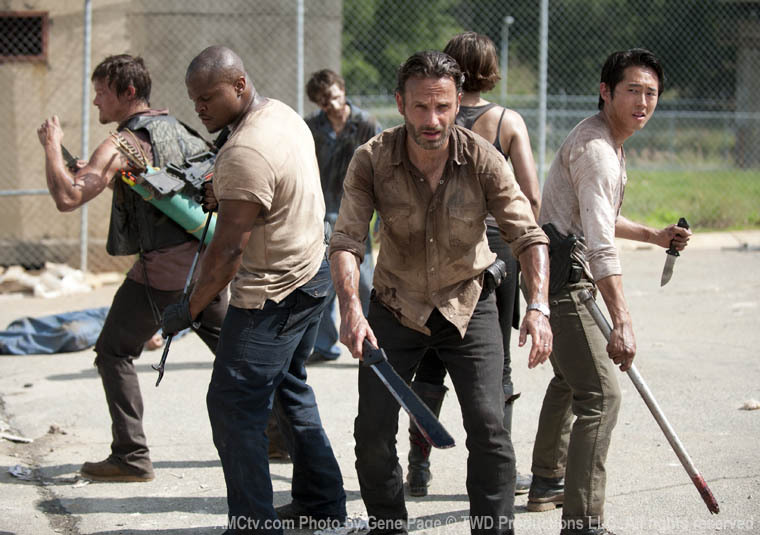 The first two seasons, a ratings and critical smash, showed Rick and a diverse band of survivors seeking safe refuge while fighting walkers, other survivors, and each other. The Walking Dead is loosely based on the comics of the same name, and uses it as a springboard rather than adhere to it faithfully; this approach enables plenty of twists, surprises, new characters, and red herrings. Law-and-order man Rick Grimes has the heart of a lion, a classic good guy so pure in his outlook and valiant in his mission he’s more like a knight from a medieval tale or a hero from a Greek myth. Joining Rick are his pretty wife Lori (Sarah Wayne Callies), his pre-teen son Carl (Chandler Riggs); Daryl (Norman Reedus), a redneck archer/tracker/outdoorsman and Rick’s wingman; Glenn (Steven Yeun), a Korean delivery boy turned resourceful street rat; T-Dog (Irone Singleton), a tough, stocky black guy; Carol (Melissa McBride), a gentle widow, having lost her husband and daughter in seasons one and two; elderly Hershel (Scott Wilson), an upright, religious country vet in whose farm the survivors sought refuge; Hershel’s two daughters Maggie (Lauren Cohan), romantically linked with Glenn, and the emotionally-troubled Beth (Emily Kinney); Andrea (Laurie Holden), a former lawyer, whose character developed over the first two seasons from a jangled bundle of nerves to a straight shooter; and the newest addition, the mysterious katana-wielding Michonne (Danai Gurira). In last season’s exciting finale, “Beside The Dying Fire”, the walkers overran Hershel’s farm, killing his daughter and son-in law, and exiling the hapless survivors. Separated from the group, Andrea is saved by the laconic Michonne, while Rick asserted his indisputable leadership (or “Rick-tatorship”, as fans are calling it). 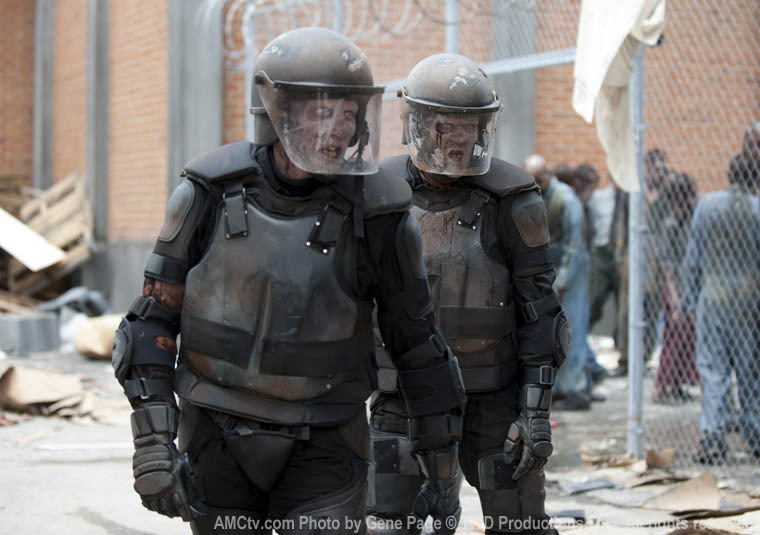 Later on, while hunting food, Rick and Daryl spy the prison shown in last season’s “Besides The Dying Fire”. 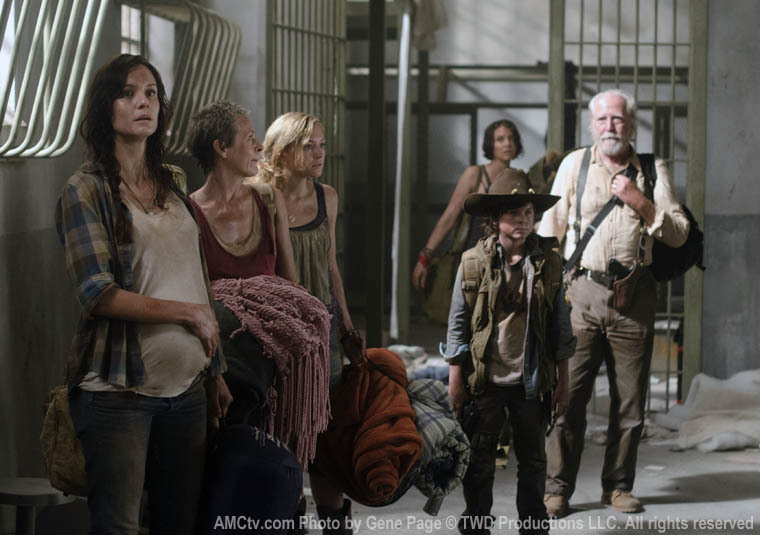 Realizing its potential for refuge, Rick devises a plan with the group to clear the yard of walkers and break into the prison (the second time this episode where we see the survivors work brilliantly as a team). Reveling in the safety of the prison yard, they whoop and holler with joy at the open space. In the morning, they clear out a ravaged, overturned cell block and settle in. 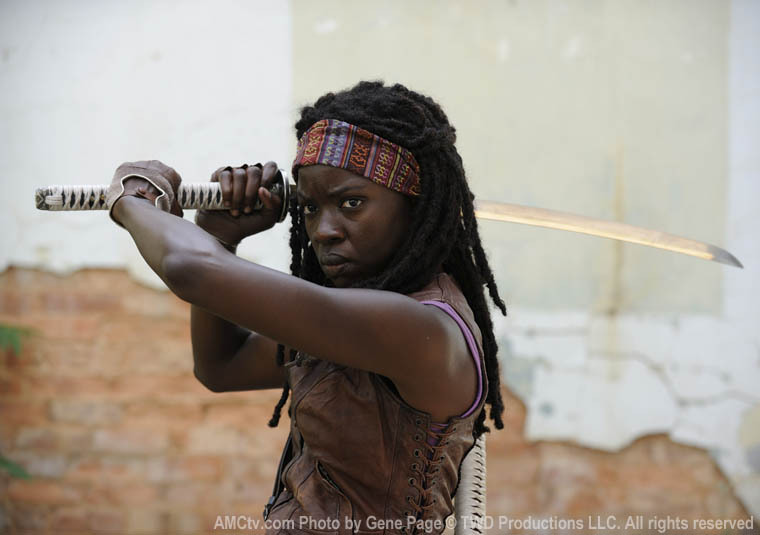 Meanwhile, we get our first glimpse of Michonne since her brief introduction last season. Entering a dilapidated pharmacy in a small town, she coolly beheads walkers while finding aspirin for Andrea, who is sick and resting safely in a nearby meat locker. Andrea urges Michonne to abandon her, but Michonne refuses. Then the two women along with Michonne’s two chained, pet-like, armless and jawless walkers set out. The Walking Dead was never the most subtle show on TV, and “Seed” doesn’t stray from the formula. The walker body count piles up as they are stabbed, hit, crushed, shot, smashed, and beheaded. Last season, fans complained of boring character development scenes and endless dialog, but the mix here is even, and in any case, that’s life in an apocalyptic war zone – endless, albeit uneasy, tedium mixed with sudden and shocking action. The writers have added a gritty layer of realism. The actors are sweaty, grungy, and covered with blood. The character development is strong. The “Rick-tatorship” reigns supreme, as his no-nonsense orders are met with immediate obedience. Daryl and Carol seem to be bonding, a process that began when Daryl obsessively searched for her ill-fated daughter Sofia (in one of the most memorable story arcs in the show). Rick Grimes and Lori have long since given up on shielding Carl from the new world around them, and instead (perhaps out of necessity) have made him an active participant. Carl is a good shot with a few notches already on his gun, and knows his role when the survivors leap into action; he is shown scavenging through the kitchen cupboards when they overtake the house. Together with his new role, the maturing boy is shown chatting with young attractive female Beth (something which has caught the disapproving eye of Hershel). But of all the characters to leap forward, Hershel has developed the most. Although he is indeed portrayed as a good man, his stubbornness last season on a number of counts – refusing to provide permanent shelter for Rick and the gang, or to even acknowledge the walker reality surrounding him – made him seem stiff and almost haughty especially in his tension-filled interactions with Rick. As season three begins, it’s easy to understand – especially in lieu of losing so much (family, farm, home) – that the wind has been knocked out of his sails. As a symbol of his acceptance and the new man that he has become, his hair is longer and the once upstanding and immaculate vet has grown a beard. In place of the tension with Rick is now a trusted, wise, elder lieutenant. Wilson, the actor who plays Hershel, is the oldest and most experienced member of the cast (he is 70 at the time of this episode’s premiere) and his life – and show biz -experience shows. His whimpering at Hershel’s amputation was so realistic that it gave me chills, as was the scene with Callies where Lori confides her pregnancy fears. It remains to be seen if The Walking Dead will continue this high level of quality for the remainder of the season; although the prison and the new character – the soon-to-be-introduced Governor, the villain from the comics -leaves plenty of room for great stories. And who doesn’t want to see zombies beheaded and mowed down? I really enjoyed the first episode, it was non-stop and exactly what fans wanted. Hershel will never make it out of this season with 1 leg!